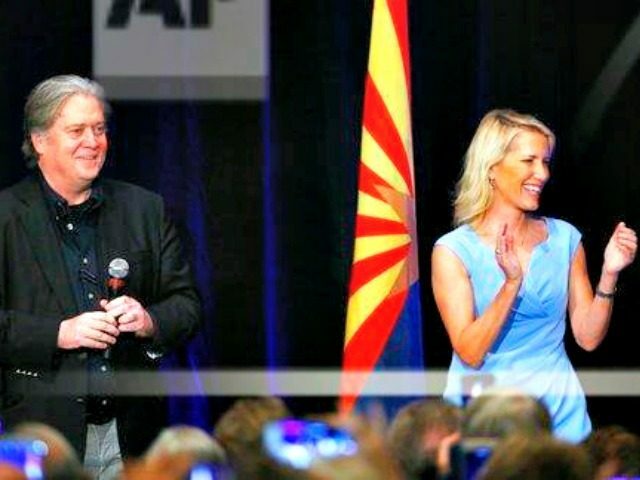 The event, which also included former White House chief strategist and Breitbart News executive chairman Stephen K. Bannon, took place in Scottsdale. Ward is challenging Sen. Jeff Flake in the 2018 Republican primary election. Ingraham joked that Sen. John McCain and Flake were busy representing Democrats and couldn’t make it to the event. “This is a pivotal time for the country,” she continued, referencing the events of the past 11 months. Ingraham said that in these months they have seen the old guard from both parties “challenged in a way that they haven’t been challenged in about 40 years.” She spoke of then-candidate Ronald Reagan’s 1976 run for the presidency, when he almost won the Republican convention and went on to win it in 1980. She said she was there for one reason, and that was because of Reagan. She contrasted the book that Flake wrote, the name of which, Conscience of a Conservative, he stole from former Arizona Senator Barry Goldwater’s “seminal conservative” book. Ingraham said you can’t do that, because people have read Goldwater and understand the movement Goldwater started in 1964. Ingraham spoke of the enemies of President Donald Trump, from Antifa to Hollywood. “On issues of immigration, trade, military intervention, the Supreme Court, Jeff Flake stands diametrically opposed to what all of you believe,” said Ingraham. She then described Ward as a courageous female, an entrepreneur, a physician, and a military wife. “Mitch McConnell said yesterday,” Ingraham started, but was interrupted by boos from the crowd. She summarized McConnell’s Monday comments that people who want to run candidates against the establishment haven’t been successful and weren’t good candidates. She then responded, “I have four words for them: Eric Cantor, Luther Strange.” Cantor lost in a primary challenge from now-Rep. Dave Brat in Virginia, and McConnell’s hand-picked candidate Strange very recently lost a primary challenge from Judge Roy Moore in Alabama. Ingraham remarked that these establishment Republicans campaign one way on issues like repealing Obamacare, then when the time came to do it, for all of McConnell’s experience, “He could not put the points on the board.” She added that Ward would help Trump have those legislative victories. “Last night Sen. McCain said that economic nationalism is essentially a scourge. It’s just a fly by night, pipe dream philosophy,” said Ingraham. You know what I think is a pipe dream philosophy? Is the idea that you’re going to arm a bunch of Syrian rebels and you’re gonna take the chance with our soldiers and our special forces on the ground, with people you don’t know, we don’t know and we can’t trust. That’s what John McCain thinks…I’ll take the common sense and the more prudent style of foreign policy frankly, of Donald Trump and then supported by Kelli Ward than I will take a nation-building philosophy that is untethered to American history and contrary to the principles of the American founding. It’s a simple question, do you trust the people or do you trust far-flung bureaucracies? Do you trust individual citizens to run their own lives and make decisions from education to how to spend the money in their purse, Do you trust them or do you trust Washington? The idea of populism of the sort that I cut my teeth on. The strains of populism that echoed in Ronald Reagan’s speeches. That ultimately amounts to one idea — returning power to the people. Jeff Flake doesn’t trust you, and I think, probably in his gut, he doesn’t like you. Ingraham said that she will watch Ward when she gets to the Senate and will hold her accountable on her show. Ingraham, who just released her new book, Billionaire at the Barricades, also spoke during a VIP reception shortly ahead of the main event, as did event speakers former White House chief strategist and Breitbart News executive chairman Stephen K. Bannon, former McCain challenger J.D. Hayworth, and Ward. Bannon said Billionaire at the Barricades sums up the populist movement and revolt that has been going on since Reagan. “We’re for law and order that benefits all people of all races, all backgrounds and all religions. What we believe it is good for all of America, not just the upper tier income earners, not just the Chamber of Commerce or the business roundtable, but for all Americans. It doesn’t matter where you came from. It doesn’t matter where you were born, if you’re an American, Kelli Ward will work for you, and I enthusiastically support her,” she told the crowd. Ingraham said her new hashtag is “#MeltSnowFlake,” an apparent reference to Sen. Jeff Flake, whom Ward is challenging in the 2018 Republican primary election.